Supposed to be a goodie! I’ve barely started. I waited for The Luminaries to settle in before tackling another doorstop. I had to get both the Audible version and the Kindle version of that to keep track of stuff. 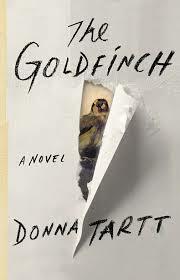 I wonder if that will be necessary with The Goldfinch, right now (on short chapter 3), it’s too soon to tell. And as it turned out I enjoyed it very much – huge allusions of Dickens and Dostoevsky, good story well told of an innocent corrupted. No huge themes, that I was aware of but fun although a bit too long.